Outreach concert transforming from musician-oriented to audience-oriented. The purpose of benefit concerts is changing. The concept of the benefit concert is often limited to receiving donations which are then used to help the underprivileged. However, the problem exists where the unprivileged were not offered to attend these concerts. Though these individuals can be offered a chance to attend these emotionally touching concerts, it is very difficult for them to travel and attend it alone. Currently, the way benefits concerts operate can help these individuals financially, but not emotionally. Therefore, recently outreach concerts are held at the location for the underprivileged to provide an even more positive outcome beyond financial aid. EnoB has taken on this approach to provide free outreach concerts for those who cannot easily travel and attend themselves. 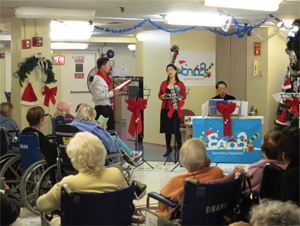 For example, EnoB held a concert for cancer patients a few months ago. 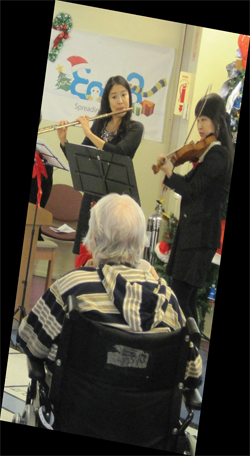 According to the patients, they said they felt not only comfort but also encouragement by watching the EnoB’s outreach concert. Beyond financial aid, sharing an emotional and cultural experience can provide greater encouragement and help to those who need it.